From some 4 million eggs (brood year 2010) laid within granitic gravels of soon-to-freeze-over Redfish Lake, 200,000 inch-long sockeye are flushed to the sea by the spring freshet of 2012. Foraging on North Pacific krill, the "bluebacks" grow to 4 or 5 pounds. Following two or three years at sea, some 4,000 survivors find their way back to the Columbia River to begin their uncertain journey back to Idaho. Nearly 3,000 will succeed the 750-foot climb through 450 miles of man-made reservoirs, as the taste of pesticides, pharmaceuticals, PCB, PBDE and DDT greet them along their way. 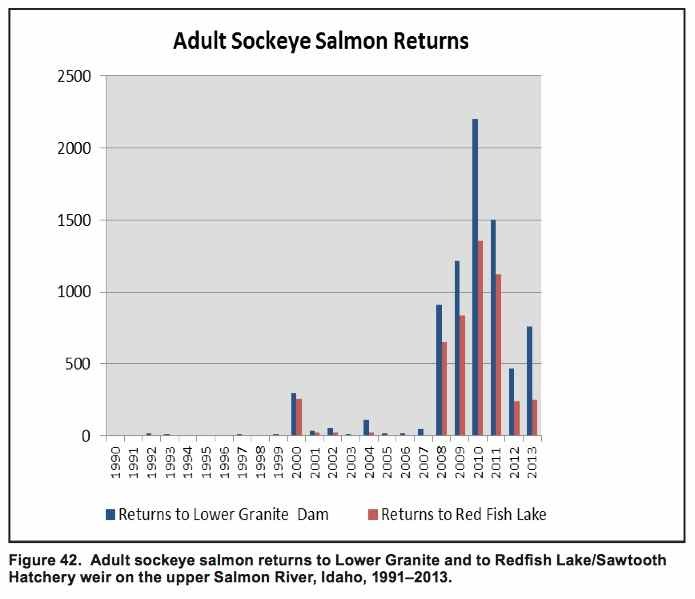 The Idaho Statesman headline "Sockeye run tops modern record," tells us of some 1,400 adults reaching their 6,550-foot elevation natal waters beneath Idaho's Mount Heyburn and Grand Mogul. Not eating on the return home, their bodies now transformed for their final act, they spawn a new generation before leaving their carcass of marine-derived nutrients along the Redfish Lake shore. Collectively they leave some million and a half eggs ahead of the coming winter freeze. A million and a half eggs from 4 million a generation before, therein lies the problem. This is not sustainable. With drastic human intervention, Idaho's sockeye escaped near-certain extinction, yet the population continues to decline. The production of hatchery fish can mask the underlying problem but it will not solve it. Near Pocatello, the Springfield Hatchery provides life support for Idaho's Sockeye. By 2020, production there will quadruple or quintuple the current numbers of hatchery fish. 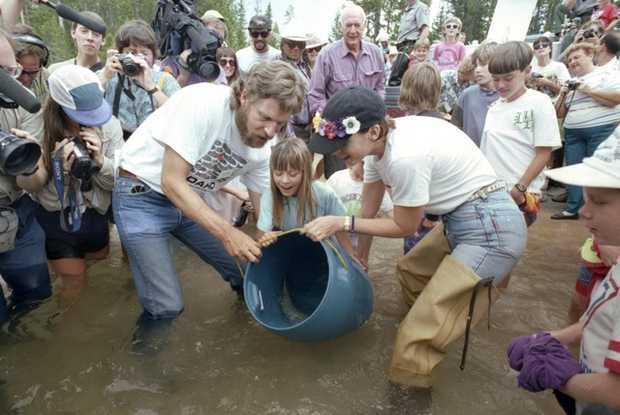 Every May, some 1 million inch-long juveniles will be dumped into the overflowing outlet of Redfish Lake. This "swamping" will fill the bellies of ducks, eagles, hatchery steelhead and bull trout, and otherwise help to conceal the more savvy natural-origin migrants. According to plan, more "record number" returns will follow, more spawned-out carcasses will decay along the shore, more carbon, nitrogen and phosphorous will feed the lake's waters and surrounding forest. The hope is that these added nutrients will greatly boost the lake's productivity of natural-origin migrants. But relying on hope is not the same as relying on science. A good hard look at Lower Snake reservoir removal is worth considering. Lower Granite, Little Goose, Lower Monumental and Ice Harbor may need to go. If we are to delist our Sockeye, obviating any need of Endangered Species Act protections, a thousand fish must be replaced by more than one thousand. Population growth is essential for delisting to take place. With both ecologic and economic arguments, the majority opinion of Western Division of American Fisheries Society recommends that four federally owned dams and reservoirs need to go: Lower Granite, Little Goose, Lower Monumental and Ice Harbor. All of the benefits of these four dams, each adding just one percent to the Northwest electric supply, can continue to be provided without the dams. Wind energy, irrigation pumps and rehabilitated rail lines are not rocket science. The recently proposed Sockeye Recovery Plan seeks to budget $100 million over the next 25 years for research, monitoring, hatchery and habitat effort. If numeric goals were exceeded, returning 4,000 adults per year would equate to $1,000 per fish - money that may well be spent elsewhere and to greater effect. Energy conservation programs are currently replacing the equivalent of one Lower Snake dam each year. These so-called "negawatts" provide the cheapest energy available and electric bills will continue downward even with four fewer government-owned dams. We simply do not need them. Delisting Idaho's Sockeye is an obtainable goal. Now is a good time for some serious discussion. Scott Levy, of Ketchum, hosts bluefish.org to promote an open dialogue concerning Idaho's salmon.